This is a list of nonhuman apes of encyclopedic interest. It includes individual apes (chimpanzees, gorillas, bonobos, orangutans, and gibbons) that are in some way famous or notable. Bam Bam, an orangutan, played Precious on the soap opera Passions. Çarli (born 1993), a chimp, starred in the live-action movie The Jungle Book (1994) and in the Turkish television series Çarli before retiring to Monkey World in Dorset, UK. Manis, an orangutan, played Clyde in the Clint Eastwood action-comedy film Every Which Way But Loose (1978), but not in the 1980 sequel Any Which Way You Can, as the "child actor" had outgrown his part. His successor died shortly after the film. C.J., an orangutan, played in the 1981 film Tarzan the Ape Man. Clara, a chimp, played Livingston in the movie comedy Delicatessen (1991). Evie (short for Evolution), a chimp, played robot dog Muffit II in the original 1978 Battlestar Galactica television series. J. Fred Muggs (a chimp born 1952) was a "co-host" with Dave Garroway on NBC's Today Show in the 1950s. Jiggs, a chimpanzee, was the first Cheeta in the Tarzan films in the 1930s. Judy, a pet chimp of the family, was depicted in the 1960s CBS series Daktari. She also played Penny Robinson's alien chimp-like pet, Debbie, in the simultaneously running Lost in Space. Kwanza (or Kwan), a gorilla, played Sidney in the romance movie Return to Me (2000) with Minnie Driver and David Duchovny. Kwan resides at Lincoln Park Zoo in Chicago. Louie, a juvenile chimp actor, played on numerous music videos and TV commercials; he starred in the popular Carpet Monkey commercials in 2007 for Human Giant on MTV. Louie retired to Little Rock Zoo with his brother Mikey in 2008. Louie died at the zoo in August 2011 from an immunodeficiency disorder, one week short of his seventh birthday. Mowgli, a chimp, was a guest on CNBC's Dennis Miller Live and on Monk. 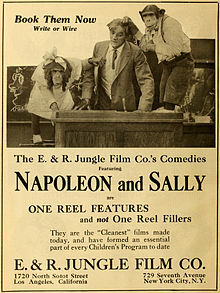 Napoleon and Sally were two chimps which starred in more than 40 shorts around 1916. Oscar, a young chimpanzee, was the subject of a 2012 Disney documentary, Chimpanzee. Pankun, a chimp, was featured in Japanese TV shows Tensai! Shimura Dobutsu-en (Genius! Shimura Zoo) and the TBS program Dobutsu Kiso Tengai! (Unbelievable Animals!) with bulldog James. Peggy, a chimp, played Bonzo in the 1951 movie comedy Bedtime for Bonzo, costarring Ronald Reagan. She, and her understudy, died in a tragic zoo fire two weeks after release of her big film. Anonymous, sometimes known as his pseudonym Bonzo, acted in the film Bonzo Goes to College. Sam (1989-2010), an orangutan, played Dunston in the 1995 movie comedy Dunston Checks In; he was trained by Larry Madrid. Zippy, a chimp, rollerskated on United States television in the 1950s. Tango, an orangutan, played Suzanne in Kevin Smith's Jay and Silent Bob Strike Back (2001). Jonah and his twin, Jacob, both appeared as the chimp Pericles in 2001's Planet of the Apes, Trunk Monkey, and with Tango in Jay and Silent Bob Strike Back. Mikey, a chimpanzee, appeared in the film Manchurian Candidate (2005), and on Saturday Night Live (2005) and the World Series of Poker (2006). Travis (chimpanzee) gained fame through parts he had in commercials (Old Navy and Coca-Cola) in the 2000s, but was shot by police following a brutal attack on a 55-year-old woman in Stamford, Connecticut. Tanga, a chimpanzee, played Inga in Dario Argento's 1985 horror film Phenomena. Peter, aka Pierre Brassau, a chimpanzee, was the subject of a famous hoax through which the chimp's paintings were presented as the avant-garde works of unknown French (human) artist "Pierre Brassau". Jenny—orangutan, encountered and described by Charles Darwin in March 1838 at London Zoo. Oliver the chimp (1957-2012)—chimpanzee, the so-called "Missing Link", apparent "humanzee"
Alfred the Gorilla (1928-1940) lived in the Bristol Zoo. Ah Meng (1960–2008) was a female Sumatran orangutan and a tourism icon of Singapore. Bill (1946–2007), a long-lived chimpanzee, resided at Sequoia Park Zoo in Eureka, California for 50 years. Binti Jua, a gorilla, saved a boy in 1996. Bobo (1951–1968), a western lowland gorilla, lived in the Lowman family home in Anacortes, Washington from his infancy until 1953, and then Woodland Park Zoo in Seattle until his death. Bokito (born 1996), a silverback gorilla, escaped from the Blijdorp Zoo on May 18, 2007 and injured a woman. Bushman, a famous gorilla from Chicago's Lincoln Park Zoo, died in 1951. While alive, he brought over 100 million visitors to the zoo; his taxidermic remains can now be seen at Chicago's Field Museum of Natural History. Charles (born 1972), a wild-born silverback western lowland gorilla, resides at the Toronto Zoo and since 1974 has been renowned for his artwork. Charlie the Chimp (1958–2010), a chimpanzee in a South African Zoo, was taught to smoke and was able to walk upright. Colo (1956–2017) was both the first gorilla born in captivity and, living to be 60, the oldest gorilla in captivity. She was born in the Columbus Zoo and lived there her entire life. Fifi, the matriarch of the chimpanzees at Sydney's Taronga Zoo, died on July 19, 2007 at age 60. Guy the Gorilla (1946–1978) was a famous gorilla in London Zoo. Harambe (1999–2016) was a gorilla shot dead by the Cincinnati Zoo after a child fell into his enclosure. This would eventually lead to the deceased ape becoming a popular Internet meme. Jabari, a 300-lb. gorilla at the Dallas Zoo, received national attention when, on Mar. 18, 2004, he escaped and attacked four people, including a toddler during a 40-minute rampage inside the jungle exhibit before being shot to death by police. He was the son of Charles the Gorilla. Jambo (1961–1992), a gorilla, cared for a boy who fell into his enclosure. Jenny (1953–2008), a western lowland gorilla, lived at the Dallas Zoo from 1957 until her death, and was the oldest gorilla in captivity at the time of her death. Julius (born 1979), a chimpanzee at Kristiansand Zoo and Amusement Park known for living his childhood with a human family. Karen (born 1992), a Sumatran orangutan, who was the first zoo animal to have open heart surgery at San Diego Zoo in 1994. Louie (chimpanzee) (2004–2011) — Louie was retired to the LRZ by his owners after a career in the entertainment industry. He was retired to LRZ with his older brother, Mikey. Santino, a male chimpanzee at Furuvik zoo in Sweden, was notable for having the cognitive skills for forward planning (calmly collecting stones, and later throwing them at visitors). Sebastian—former resident of the animal orphanage near Nairobi National Park, Kenya, famous for smoking and not requiring a cage. Shabani, a male Western lowland gorilla known for his "photogenic" and "metrosexual" appearance, as well as his talent for tightrope walking. Currently resides at the Higashiyama Zoo in Nagoya, Japan. Snowflake (1964–2003), the only known albino lowland gorilla in history anywhere. Temara (born 1993), the first zoo-reared female Sumatran orangutan, was released into Bukit Tigapuluh National Park by Perth Zoo in 2006. Willie B. (1959–2000), a silverback gorilla kept in isolation for 27 years, became head of a troop and father of five. Yeroen, a chimpanzee at the Arnhem Zoo, was the star of de Waal's Chimpanzee Politics. Macaco Tião, a chimpanzee, had the habit of throwing excrement at visitors (including several politicians) to the Rio de Janeiro Zoo. A satirical newspaper ran his candidature for Rio de Janeiro mayor in 1988, and he got 9.5% of the votes, just behind Marcello Alencar and César Maia. Colossus the Gorilla was a main attraction at Benson's Wild Animal Farm in Hudson, New Hampshire, who attempted to have Colossus put on the ballot in the 1980 New Hampshire Republican Presidential primary. The zoo tried to argue that the U.S. Constitution does not specify that a native-born candidate has to be human. ^ "Mowgli the Chimpanzee". Center for Great Apes. Archived from the original on 2012-06-11. ^ Slide, Anthony (1998). The New Historical Dictionary of the American Film Industry. Routledge. p. 106. ^ "Woman in surgery 7 hours after chimp attack". 2009-02-21. Archived from the original on 2009-02-21. ^ Caswell, J. L.; Mallick, S.; Richter, D. J.; Neubauer, J.; Schirmer, C.; Gnerre, S.; Reich, D. (2008). McVean, Gil (ed.). "Analysis of Chimpanzee History Based on Genome Sequence Alignments". PLoS Genetics. 4 (4): e1000057. doi:10.1371/journal.pgen.1000057. PMC 2278377. PMID 18421364. ^ "Cincinnati Zoo Devastated by Death of... - Cincinnati Zoo & Botanical Garden | Facebook". www.facebook.com. Retrieved 2016-05-30. ^ "Karen". San Diego Zoo Centennial. 18 March 2015. Retrieved 9 March 2019. ^ David, F.; Jamel, A. "Fundação RIOZOO" (in Portuguese). Prefeitura da Cidade do Rio de Janeiro. Retrieved 2013-02-13. ^ Garnick, Darren. "Hillary Cried Here: An Unconventional Tourist Guide to the N.H. Primary". Tourist Guide to the N.H. Primary. The Atlantic. Retrieved 10 January 2014.